At the 2013 Associated Writers and Writing Programs Conference in Boston, I wandered among rows of bright, strange, and intriguing books piled high on independent poetry press tables. Hand-stamped, letter-pressed, spray-painted, ripped, sewn, and covered in tinfoil; poems shaped like boxes, poems printed on records, poems made into pop-ups or puzzles, or rolled as cigarettes — I even spotted a tiny book hidden inside a plastic egg. The small presses occupying real estate at the AWP book fair represent a fraction of the artistic output that marks what can be seen as a resurgence of the handmade book and the book as art object in contemporary poetry practice. The exciting variety of these book-object wares suggests a vital world of poetry, visual art, bookmaking, and communal production. In these composed book-works, techniques of production, including design, collaboration, and distribution, are part of the poem. The paper, binding, page sequence, gutter, and cover all contribute to our understanding and experience of the poetic text. Acknowledging this necessitates a reading practice newly attentive to the material nature of bookmaking in order to understand works whose compositional practices consciously incorporate physical book structures into the made poem. By writing about two such poetry book-works, Mary Ruefle’s A Little White Shadowand Jen Bervin’s The Desert, I ultimately want to offer a record of encounter, a thinking through and with the book objects at hand. Each of these works takes an earlier book as its physical and conceptual impetus, sewing or painting over existing text and so making a new work from a previously obscure or forgotten text. Marcel Broodthaers’s purely graphical recreation of Mallarmé’s Un Coup de Dés (1969) and the altered book-works of Ronald Johnson and Tom Phillips from the 1970s and 1980s are perhaps the most emblematic examples of this practice and perhaps the most famous. Each employs Duchampian and neo-Dadaist notions of the defaced book in order to enact the ways in which works of art and literature are always already a reshaping of the tradition. Others have written about the relationship between original text and altered image in Phillips’s work A Humument, but its status as an inspirational prototype has yet to be fully assessed in light of later defaced book-works. The same is true for Ronald Johnson’s Radi os, a book-length rewriting by excision of Milton’s Paradise Lost. While Phillips’s and Johnson’s excisions can be read as unrepeatable conceptual acts (what was conceptual had to do with their newness as well), there is no doubt that erasure has taken on the weight of a new genre within poetry practice. A spread from Broodthaers’s Un Coup de Dés (1969). In recent articles, Travis McDonald and Marjorie Perloff each locate the origins of what’s commonly called “erasure poetry” in conceptual models of appropriative or restraint-based poetry such as Oulipo or Flarf. While this is certainly a valid entrance point into a still little-discussed topic, I suggest we also view erasure poetics in the context of the material substrate of the book as object, a view which allows for a richer understanding of both compositional process and conceptual or creative effect. By subverting our expectations for reading within a codex, these defaced (or even re-faced/re-surfaced) books promote new forms of tactile reading in the service of phenomenological investigation and often offer an experience of time with greater fidelity to the process of duration as it occurs in everyday life. Ruefle’s A Little White Shadow appeared in 2006 from Wave Books as a digital reproduction of Ruefle’s initial erasure. With its high-resolution reprint, Wave Books attempts to render visible the three-dimensional textures of the original text, maintaining an awareness of the poet’s hand in the poetic undertaking. In 2008, Granary Books published Bervin’s book, The Desert, with the help of a team of seamstresses, as the colophon states, in a digitally printed, machine-sewn, and hand-bound edition of forty, combining new technologies with traditional book arts practices, and, like Ruefle’s text, retaining an awareness of the poet’s composition method in the resulting artifact. Deploying the defaced book as phenomenological investigation, Ruefle’s A Little White Shadow and Bervin’s The Desert begin, like A Humument, with nearly forgotten books. Each work utilizes texts that are over one hundred years old and have escaped the notice of most contemporary readers. As such, each project can be read as an act of reclamation as well as renovation. Jen Bervin’s The Desert (Granary Books, 2008). The Desert takes as its primary text John Van Dyke’s 1901 book of the same name, a detailed account of his journeys through the deserts of America. Rather than working directly on the original edition, Bervin digitally reprints the first seven chapters of Van Dyke’s book on handmade abaca paper. The text of each of these new books is then sewn over row-by-row with more than five thousand yards of light blue silk. 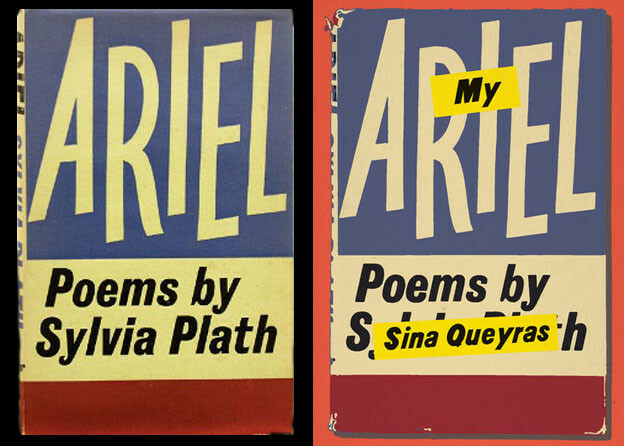 The cover is wrapped in the same rough abaca paper and bleached to the color of sand, the title is hand-punched with small holes that form the letters. No ink or thread appear and the author’s name is also absent; instead, the negative space of the holes represents the book’s name, as if it had drained like sand into the pages that follow. The cover of the book alludes to the visual landscape of the desert and to the simultaneous presence and absence of Van Dyke’s original record. It also demonstrates the hand’s role as one of removal — the rough paper has been leached of color, the title is punched out rather than inscribed, the look, entire, suggesting absence. And yet, upon opening the book, we experience the beauty and abundance of a field of blue silk zigzags. Bervin writes in the colophon: “John Van Dyke writes of the American deserts as necessary breathing spaces; my sewn poem is narrated by the air.” Describing her erasure as a single poem “narrated by air,” she refers to the project’s attempt to create its own elemental landscape within Van Dyke’s depiction of American wilderness. On an early page, Van Dyke’s text has been sewn over line-by-line to reveal only two words, each an utterance that is equally speech and exhalation: “Ah! / Air!” Out of the reconstituted landscape of the page, speech erupts, forming its own breathing space, furthering Van Dyke’s conceptual project, and creating a space of release for the body of the text within the landscape of the page. Not only does Bervin make tangible Van Dyke’s poetic attention to visual phenomena, she creates sensations within the act of reading through the haptic quality of the erasure. Bervin’s erasure enacts, in the book’s own archeological terms, both a burial and an excavation. Covering over the bulk of Van Dyke’s record of his wanderings in the desert, the three-dimensional, textured surface of the blue stitching lures the reader’s hands to participate in the text. In these raised blue fields, we also find pockets of text that have been left open or have been sewn over and subsequently uncovered once more, the pockmarks of the removed thread still visible. These pockets of text exist as fragments, such as the single legible word on page 26: “missing.” In most instances, however, the visible fragments can be read across the page to form longer (often self-reflexive) statements about observation and composition. Texturally they exist as spaces of absence or flatness within the book. Visually, however, they form the darkest marks on the page and draw the eye to read the poem as an excavation in the midst of the blue field of stitches. Van Dyke’s text exists as one man’s record of his senses, which Bervin’s attentive erasure excavates to further reveal a meditation on light, vision, composition, and ultimately, the body’s absence in the landscape of the wilderness. Jen Bervin’s The Desert (Granary Books, 2008). Back side of page 16/17. Within this meditation, the tensions between the revealed words, the absented/covered words, and the textures of the glacial silk continually push the reader to recognize the reconstitution of form as a legitimate investigative and poetic endeavor. Bervin’s page, which contains what was in Van Dyke’s original a spread of pages 28 and 29, demonstrates just such an awareness of its constructed nature. In this excerpt, “showing —” physically demonstrates the excavation — the needle marks around the word do in fact show us where the thread has been sewn then ripped out to uncover the word. A small black tail also hangs from the end of the word, a half-hidden em dash partially sewn over which looks in its semi-visibility like a black thread running horizontal to the vertical zigzag of Bervin’s stitches, forming a visual echo in which the text itself looks as though it might have been sewn onto the page. In a chapter retaining its original title, “The Make of the Desert,” we find further demonstration of the intervention of the poet’s hand and eye in the construction of meaning. Here Bervin leaves the entire em dash uncovered, the threading together of the text indicated in a visual pun and followed by a verbal pun upon the needles, the spear-points, the instruments of the hand that have punctured the text and transformed it from inscribed word to observable action. The text instructs us to take notice of the blue threads folding back into the page and the pages folding into the book as a whole. Ultimately, we are being asked to pay attention to the inquiries the text is able to perform or suggest by what the hand veils or leaves open to air. That Bervin considers the erasure a collaboration is evident from the title page on which her name and Van Dyke’s are presented side-by-side as authors. Mary Ruefle’s erasure, A Little White Shadow, presents itself less as a collaboration between living author and dead than as a renewal of the book’s surfaces, a refreshing of each page’s semantic possibilities, a recalling of life force from a text long forgotten, left for dead. On the title page, the name of the original author has been covered over with correction fluid and Ruefle has signed her name on top of this in black ink. Much of the rest of the title page has also been put under erasure and what remains reads: “So much the less complete / First Edition / WAVE BOOKS / Seattle & New York / 2006.” The title page not only insists on a new author who replaces the original but on a new first edition dated 2006 rather than 1889, A Little White Shadow’s original publication date. Taking into account the ironies of correction fluid versus thread, we must recognize that where Bervin seizes the original material and stitches together a coherent poem from the text, Ruefle obscures the text with correction fluid, creating a rough base where a revision or re-seeing of the text might occur. Rather than a burial and excavation of the text, Ruefle performs a masking, applying a ghosted surface, leaving the uncovered phrases to act as new activations of syntax and sense. The thick application of the correction fluid and its visible brushstrokes resemble impasto on canvas, the bright white of the fluid always fresh against the brown, tea-stained look of the book’s aged paper. The drama of the white fluid on the rough background resembles Robert Ryman’s attempts to access an experience of presence by offering an immediate awareness of light and surface in the subtle textures of his white paint. Mary Ruefle’s A Little White Shadow. Courtesy of Wave Books. In A Little White Shadow, Ruefle concerns herself with the absence of that which the text has never been able to make present. On an early page spread, the reader encounters ghosts of the text’s absent bodies: “seven centuries of / sobbing / gathered / in the / twilight. / and / had their / pages / wandered, / through.” And on the facing page: “the / dead. / borrow so little from / the past / as if they were alive.” Ruefle embarks on an investigation of the absence always already a part of our temporal existence. A little farther on, the text depicts an image, or depicts the depiction of an image: “I had been / sketching / tall pink / heather, / her hat being the only thing moving.” As we read the line “her hat being the only thing moving” our eyes suddenly register the flow of text (or the movement of our eyes along the stream of text) as the only thing that is in fact moving in the blank field of the whited-out page. The facing page seems to address the strange tension in which the messy white blocks of correction fluid and the crisp black lines of text exist and interact. “I was brought in contact with the phenomenon peculiar to / “A shadow.” The blank, whited-out spot between “A” and “shadow” suggests we fill in the image for the word, supplying “white” for the stroke of white that has interrupted the phrase. As our eyes then travel across the next field of white, we read “Everyone you met was sure, sooner or later, to speak / the / time —.” If each page operates as both a visual space and a readable text, then we as viewers and readers become aware of the ways in which the nontemporal medium of paint interrupts the linear duration of the verbal medium, creating visual pauses which read as verbal delays across the enjambed lines. If we compare the pacing of A Little White Shadow to that of The Desert, the fluidity of Bervin’s text across pages illuminates the dramatic fragmenting of Ruefle’s text. 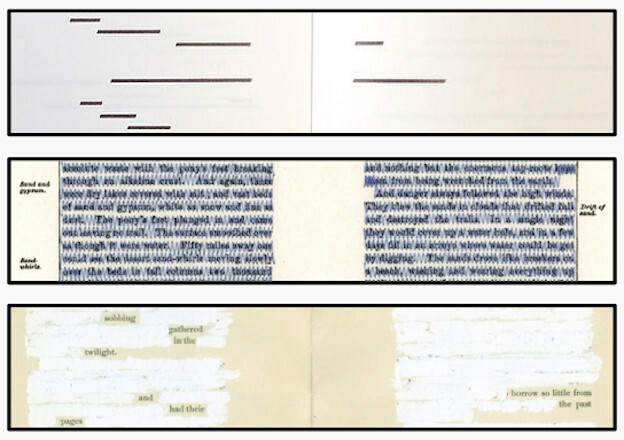 Each text has been turned from verbal to plastic art: in the bas relief of silk weaving in the one case, in the virtual “painting out” of the page in the other — so that in the latter case, digitally reproduced, Ruefle’s book is more like a set of plates in an art monograph than a set of pages, with all its haptic lure intact. Many of the pages function as text/image works which stand alone and, although the book is readable as a coherent text, it does not read as a single poem. The text’s fragmentation allows us to experience the disruption of duration so that we become aware of our expectations for the book’s form and for syntax in general. The correction fluid interrupts the temporality of the movement of words across the page and, in turn, disrupts our expectations for the time it will take to vocalize the text. Syntax, then, is equated with time, and erasure here functions as a mimetic activity for the erasure of time itself. A Little White Shadow is able, through the interaction of its visual and verbal elements, to enact an experience of time with greater fidelity to the process of duration as it occurs in lived experience. Ruefle registers the experience of the body in time. Although the brushstrokes in the correction fluid look three-dimensional, the book’s haptic quality is illusory in its digital reproduction. Even so, the book’s look encourages the fingers to at least try to feel the grooves on the page, and our eyes still remain sensitive to its textures. At points the text also encourages us to move our eyes over the shapes of the correction fluid. On page 22, the text reads: “Think me / lazy / always idle; but / my brain / grows weary / just thinking how to make / thought” and, between each line, the patterns of white seem to form the shapes of words as they have not done on the rest of the page. The correction fluid forms illegible script-like shapes that register as readable lines rather than elided text, and we feel compelled, as we read through the lines, to strain the eyes, pushing the white images to resolve into a readability which the images ultimately deny us. On the facing page, it is as if the text has decided to answer our efforts with an explanation of its methods: “very simply, / ‘It’s always noon with me. / pale, and deformed but very interesting, / ’”. Noon appears opposite the reader’s struggle to simultaneously read and see both text and image at once. On the book’s final page, Ruefle again turns our attention to the book as an object in time and to the archive from which it has been pulled, the archive to which it will return upon its closure. On the last page, the word “END” is mirrored and distorted by a strange boxed phrase Ruefle pastes below it: “on end.” The phrase calls up weaving, end-on-end denoting a fabric woven by alternating colored yarn and white yarn to created a checkered effect and smooth texture. While Ruefle’s erasure does in some ways weave her white shadows with the text, we are not left with a smooth texture, and this definition might better suit the fluid stitching of Bervin’s poem. The phrase also brings to mind the notion of setting a book on its end. Each act of erasure transforms the archive while simultaneously preserving the artifact. In this action, we recognize a larger commentary on language as occlusion — as a drama of both blotting out and inscription. The books enact the truth that everything that comes into presence necessitates an absence. We must then look at erasure in the context of what the poets preserve, the words, phrases, poems selected and revealed, in order to understand the practice of erasure, of art and aesthetics, as a method of selection that provides, if not a goal of complete retention and recollection, then an affirmation and preservation of what might otherwise be lost. The act of preservation exists as participation — a transformation of the material and of our own experience of the material. Ultimately, the books want to be readable. They describe an aesthetics, even an ethics, of active selection — of world-fashioning — and are, therefore, affirmative even as they interrogate the processes and politics of the act of selection itself, of who and what we choose to foreground. 3. Mary Ruefle, A Little White Shadow (Seattle: Wave Books, 2006). 4. Jen Bervin, The Desert (New York: Granary Books, 2008). 5. Marcel Broodthaers, Un Coup de Dés Jamais N’Abolira Le Hasard (Antwerp: Wide White Space Gallery, 1969). 6. Tom Phillips, A Humument: A Treated Victorian Novel (New York: Thames & Hudson, 1987). 7. For two such discussions, see William H. Gass, “A Humument: A Treated Victorian Novel, 1973,” Artforum 35, no. 3 (November 1996), and Hayles, Writing Machines, 2002. 8. Ronald Johnson, Radi os (Albany: Sand Dollar, 1997; reissued Chicago: Flood Editions, 2005). 9. Travis McDonald, “A Brief History of Erasure Poetics,” Jacket 38 (2009). 10. Marjorie Perloff, “Poetry on the Brink,” Boston Review, June 2012. 11. Bervin, The Desert, 16 and 17. 12. Ruefle, A Little White Shadow, 8.